Book Review: Of Course It’s Butterfingers! by Khyrunnisa A. ‘Of Course, It’s Butterfingers’ is a cocktail of adventure, fun, excitement and learning. The book contains many short stories that describe Amar’s adventures. ‘Onomatopoeia’ has been opted as the literary tool and it will definitely cater to the interest of the little children. I remember reading ‘Pinky’ during my childhood days. I was so much in awe of that mischievous character that I always wanted to try to become like her and try her tricks and pranks on others. Butterfingers (Amar) reminded me of Pinky and helped me take a walk down the memory lane. Amar is impish yet charming. His mannerisms and ideas can make you love him. But at the same time, his tendency to fall into trouble might make you think of him as vulnerable. Yet in all his jaunty rides, he emerges victorious. His jovial nature and optimistic outlook is something to imbibe. The cover of the book neatly presents the main conflict of the plot. The illustrations (in broad strokes) strike the right chord and will be liked by the children. The freehand sketches that appear time to time act like an icing on the cake. The main character of the story is Amar and the most dominant trait that can be identified is his impish behaviour. The story focuses on Amar’s reluctance to understand the need to become sober. But what is childhood without being playful? Overall, this is the first Butterfingers book that I read and I thoroughly enjoyed it. Oozing with cheer and delight, the stories will amuse the readers. 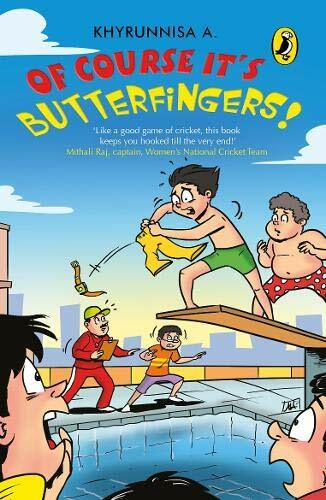 Enjoyable, engaging and enthralling- Butterfingers is a book that is sure to leave an imprint on your mind!